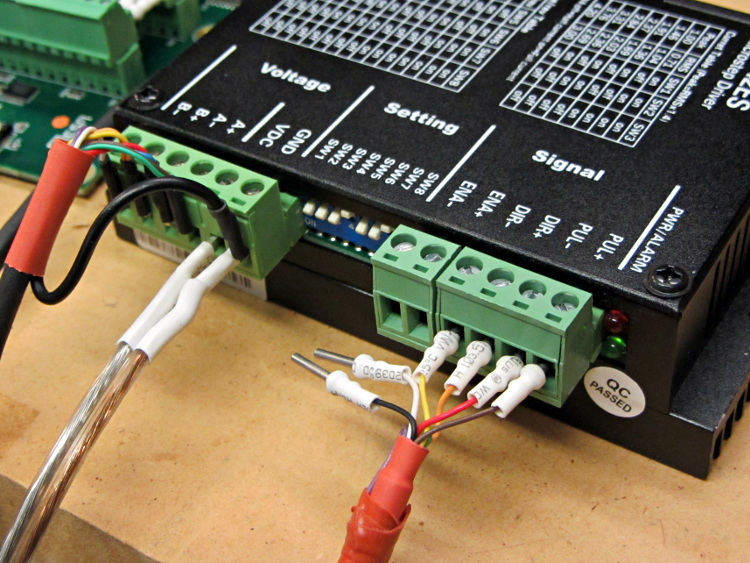 Both the Mesa 7i76 and the M542 stepper driver boards use Phoenix-style pluggable screw terminals that simplify the connections: just strip the wires, jam them into the holes, and tighten the screw. That works great in an industrial situation where the equipment gets wired up once and stays that way forever, but I expect that I’ll be doing far too much twiddling… which means the stripped wire ends will fray and shed strands across the boards. So, while wiring up a stepper motor, I tried soldering the wires to several different terminals I have lying around, just to see how they work. 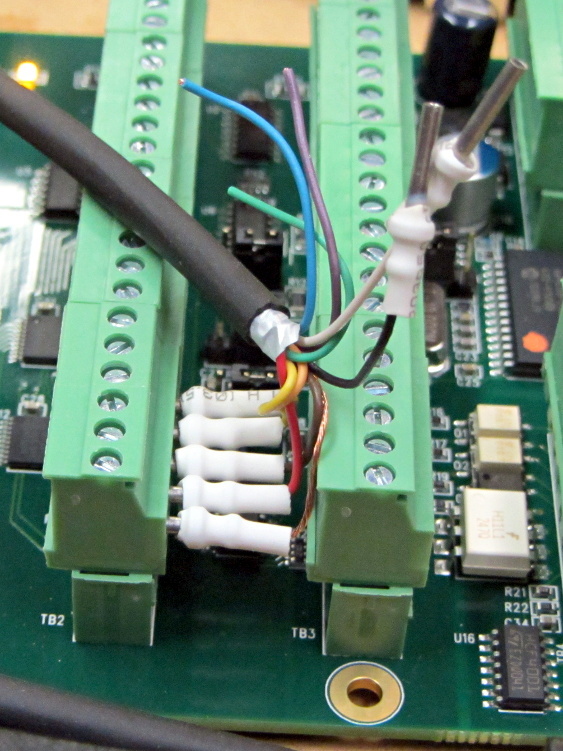 On the far left, the four stepper wires end in right-angle PCB pins harvested from surplus connectors. This didn’t work nearly as well as I’d like, simply because the pins are entirely too bulky. I’m not sure quite how the bricks will be arranged, but I think a right-angle connection won’t work well at all. The field power from the 24 VDC supply arrives on some (cheap) 18 AWG speaker zip cord, terminated in straight-line PCB pins. Those worked better, but they do stick out a goodly amount. Methinks the right thing to do with larger wire is just solder the strands together, clean the end, and not bother with pins. That’s not so good for strain relief (it concentrates at the end of the soldered strands), but, with some tubing added, maybe it’ll be Good Enough. The 26 AWG input wires from the 7i76 terminate in turret pins originally intended for PCB terminations or test points, back in the day when you (well, I) could actually see such things; I have a bag of 1000 that I’ve been chewing away at for a while. I think these wires are simply too small for the screw terminals, so they really need a pin of some sort and I like the way the turret pins work. The heatstink tubing provides a bit of strain relief, which always comes in handy. The two stray wires will eventually go to the “Enable” input. It turns out that these bricks defaults to Enabled with no input signal, so you cannot depend on a wiring fault disabling the motor: a broken Enable wire enables the drive output. This seems flat-out dumb, but I suppose there’s some planet on which it makes sense. So the next iteration must be a bit shorter. Yes, you can get commercial crimp pin terminations; search eBay for crimp insulated terminal pins, some of which are curving around the planet even as I type. They won’t fit into the tight confines of the 7i76, but they should be better for the M542 bricks. The smallest size fits 22 through 16 AWG wires, so my tiny cable wires may need some steroids to bulk ’em up. The alert reader will notice an egregious wire color coding faceplant. I made a corresponding blunder on the other end and nobody will ever know. Next time, maybe I’ll get it right. The thin black cable has nine 26 AWG conductors that I’m doubling up for the motors. In round numbers, 26 AWG stranded has about 120 mΩ/m resistance, so two in parallel work out to 60 mΩ/m. 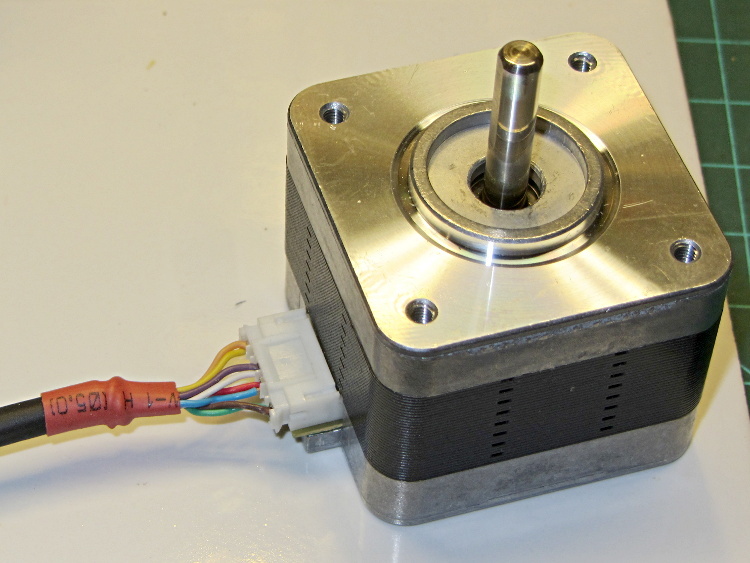 Assuming a meter of cable between the driver and the motor, a 1 A winding current will drop 120 mV along the way and dissipate 1/8 W, which seems defensible. It’s obviously Good Enough for signal wiring. It is most definitely not good enough for, say, the heaters. The motivation for using that cable: it’s thin and super-flexy, not the rigid cylinder you get with larger conductors. 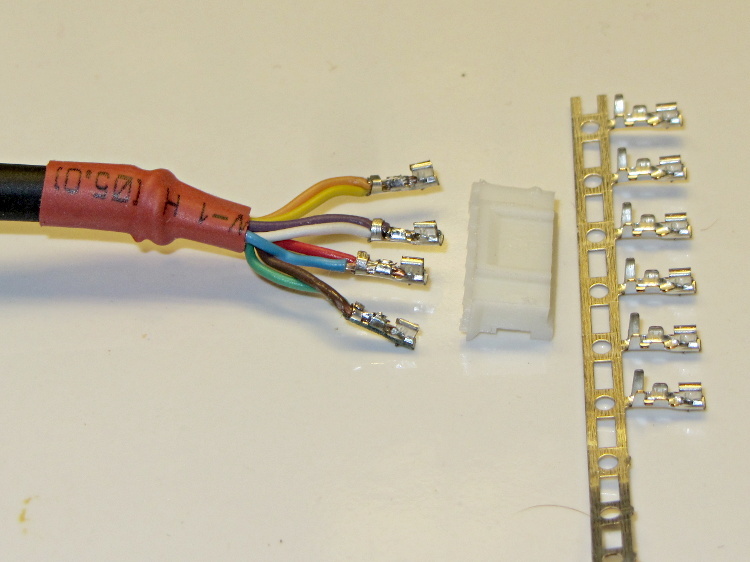 Plus, I have a huge supply of the stuff… it originally served as RS-232 cable, with molded connectors on each end of a 30 foot length, with four such cables assembled into a super-cable with nylon padding yarn laid inside a protective outer sheath. Must have cost a fortune to the original buyer; decades ago I got three or five of the assemblies and have been harvesting cable ever since.